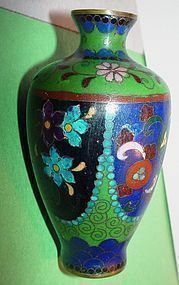 Ca 1930 A beautiful little vase with deep emerald green ground. The cobalt panels are highlighted by pink, blue and purple flowers. A scalloped design near the bottom is edged in gilt. Modest wear with some paint loss, and a few small nicks and pits (please refer to photos) ... Full brass base and rim. No marks.The colors are brighter due to the flash. 2-1/4" x 4"